A rendering of the proposed Barack Obama College Preparatory High School. LINCOLN PARK — When Barack Obama College Prep opens in the fall of 2017, some 70 percent of the students, picked from around the city, will be admitted through a selective-enrollment process. The other 30 percent, or about 120 students per year, will be from what school officials call the neighborhood around the school, planned for Stanton Park at 618 W. Scott St. The exact area that will be considered the "neighborhood" for enrollment purposes is the great question, with many highly anticipating the answer. Chicago Public Schools officials haven't defined the area. But the proposed school, just north of Division and Halsted streets, means the boundary would likely stretch into a number of North Side neighborhoods. 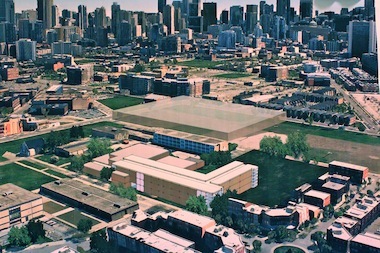 The $60 million school will be paid for by Tax Increment Financing funds from the Near North TIF district, and that area, bordered roughly by North Avenue, Wells Street, Chicago Avenue and Halsted Street, will be included in the neighborhood boundary, officials said. 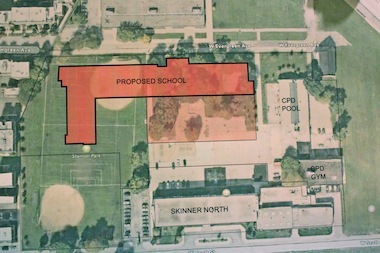 A map of Stanton Park with an outlay of the proposed Obama College Prep location. Ald. Michele Smith (43rd), who stood alongside Mayor Rahm Emanuel and Ald. Walter Burnett (27th) at the news conference announcing the school in April, said the boundary "likely will include part of our ward." Not all neighborhood students will be admitted. They, too, will have to test into Obama College Prep but will only compete with other students from their neighborhood. Still, that could provide high-achieving students in the neighborhood — who might not otherwise get into selective-enrollment schools such as Walter Payton, Northside College Prep or Jones College Prep — another chance. John Irwin, a real estate agent who specializes in properties in Lincoln Park, Near North and Lakeview for Baird & Warner, said the neighborhood boundary enrollment at Obama College Prep would provide a "major boom" for the neighborhood. Irwin said nearby Walter Payton College Prep, 1034 N. Wells St., "is nice to have in the community" but isn't much of a draw from a real estate standpoint, as it is 100 percent selective-enrollment. Depending on how the boundaries will be drawn for Obama College Prep, "it would be huge," Irwin said, because "school choice here is very, very important." Including a neighborhood percentage in a selective-enrollment school is not common, but some do have that component. At Jones, 700 S. State St., the neighborhood zone stretches as far as four miles away from the South Loop school. Burnett has said the Obama neighborhood component came after he complained to Emanuel that Payton began with the idea that neighborhood students would get a percentage of seats, but that soon after it opened in 2000 an "amnesia" set in, and local kids were treated the same as students from across the city. "He said, 'OK, I'll tell you what I'll do: I'll give you another high school, and I'll give you a community component'," Burnett said. At a community meeting in April, Meghan Harte, an Emanuel deputy chief of staff, said if there were more qualified students in the neighborhood boundary than the 30 percent allows, the slots could be decided by a lottery. "There will be some element of competition to get into these seats because there is such high demand for a selective-enrollment school," said CPS spokesman Joel Hood. "We definitely wanted to make allowances for people who live near the school to have an opportunity to get in." Also remaining to be decided is the curriculum for the school and how classes would be divided between high-scoring selective-enrollment students and neighborhood students. City officials have said the neighborhood boundary will be worked out with local aldermen, but the thought is to include the former Cabrini-Green area and surrounding communities. The number of youngsters vying for slots will likely increase. Developers have proposed about a dozen developments for Near North that are expected to add about 2,500 residential units to the neighborhood, according to a DNAinfo Chicago analysis. Some of those projects are in the planning phases, such as the Atrium Village 1,500-unit development at Division and Wells streets. Others, such as the New City Development with 199 apartment units, are underway. And competition to get into the city's top high schools is on the rise: Applications to selective-enrollment schools jumped 8 percent this school year, according to CPS, with 16,440 students applying for 3,200 seats throughout the school district. More than 2,400 students this year who qualified for admissions into a selective-enrollment school were denied because there were not enough seats available, according to CPS. Obama College Prep would be the latest in efforts to improve schools near Lincoln Park. Over the last year and a half, Lincoln Park High School's curriculum has added a wall-to-wall International Baccalaureate program, and CPS announced plans to build a $20 million, 18-classroom addition to the neighborhood's top scoring elementary school, Lincoln. Another $17 million plan would add 300 seats to Walter Payton College Prep. Smith said she has made it a priority to keep families in the neighborhood and reverse the trend of families fleeing to the suburbs in search of better education. "It's all about the schools," Smith said. "It's a No. 1 issue for parents. The minute someone becomes a parent what they want to know is, 'Is there a good school for my children?'" Smith points to a growing population of children in her 43rd Ward. From 2000 to 2010, the number of children under 5 years old in the 60614 ZIP code, which includes all of Lincoln Park, increased by 23 percent, to 3,354 children. The number of children ages 5 to 9 increased by 39 percent, to 2,103 children, and kids ages 10 to 14 in the neighborhood increased by 13 percent, according to U.S. Census data. "Keeping families in the city is certainly one of my top priorities, and we have been taking a lot of steps to further that," Smith said. "[Obama College Prep] promises to be another component to address the need to keep people in the city throughout high school."